Have you seen the film The Mole People? In brief, a few hapless archaeologists accidentally find a race of Sumerian albinos living deep underground. At first the Sumerian albinos believe the hapless archaeologists are Gods because they have a flashlight and sunlight, which kills your average Sumerian albino who lives deep undergroundit literally burns them up. They are worshiped as Gods. But eventually they realize the hapless archaeologists are not Gods and what tips them off is the fact that the archaeologists show emotion and pain. Sumerian albinos living deep underground do not. I spoke to Richard Beers, T.H.E. Show’s President about attendance at the first ever T.H.E. Show Newport Beach and he scientifically deduced over 4000. This estimate was based on the fact that he’d ordered over 4000 lanyards, the thing every attendee uses to hang their badge around their neck, and they were nearly gone on Saturday afternoon. I heard people talking even higher numbers but I’ve got no way to verify their enthusiasm. In any event, this event was a complete, 100%, slam-dunk. 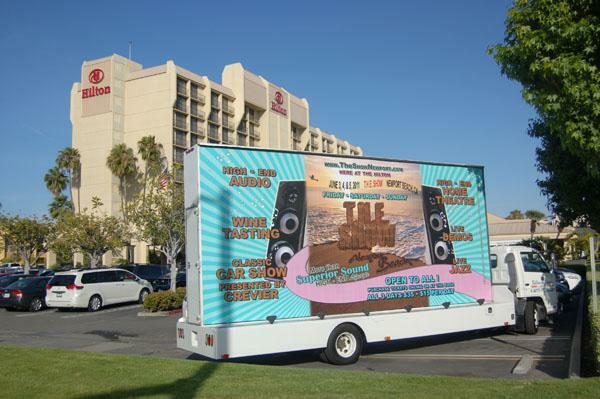 . .
Oceanside, CA-based retailer The Home Theater Experience was, counterintuitive to their name, showing the old–school style Tannoy Yorkminster SE loudspeakers paired with Cary CAD 805 Anniversary Edition monoblock amplifiers and the Cary SLP 98L preamplifier. Front-end duties were handled either by a Cary CD 303T SACD Professional Version player or a Krell Kid iPod Dock. All cables and room tuning were from Synergistic Research. Yes, another room using the ART acoustic treatments. Hmm. Unfortunately pricing information was not available on a one-sheet and time did not allow for note-taking. Basically it was after the 5:00pm closing time of the show. This system was also very easy to enjoy and Oscar Peterson sounded like the Maharaja of the keyboard to quote Duke Ellington. You can see in the picture that one very discriminating listener approves of the sound but appears to disapprove of my camera clicks: "Excuse me, we're listening here." I was looking forward to the MBL rooms because I’ve never had the time to spend the time listening to their gear. MBL is another singular manufacturer following an extremely personal vision, yet in this case one that tries to widen the appeal, so to speak, to a larger audience. 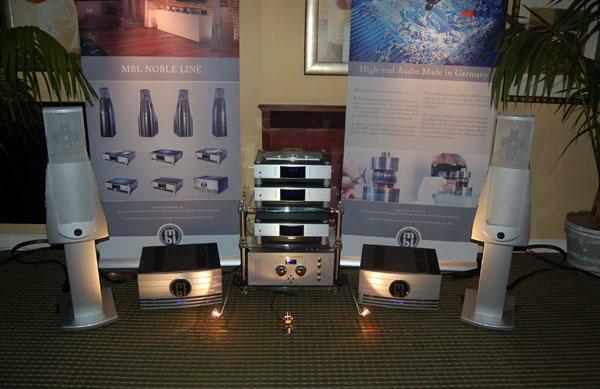 The smaller MBL system consisted of the Radialstrahler 120 loudspeakers ($21,400/pair) with stands ($1630), 9007 monoblock amplifiers ($21,400/each), 6010D preamplifier ($26,500), 1511F DAC with MBLMCMi asynchronous USB input ($11,800), and 1521A transport ($12,200). Cabling was Wireworld Eclipse 6. 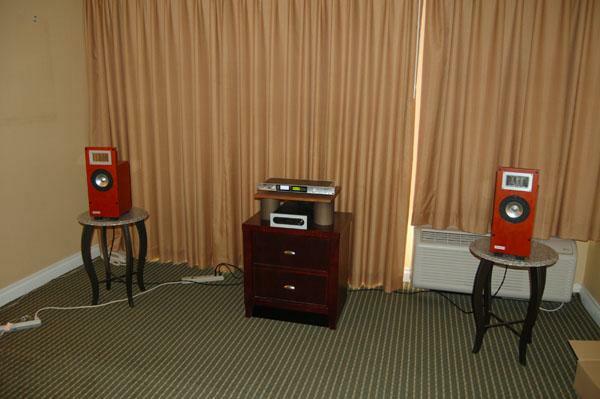 This smaller system, which mixed and matched components from MBL's three lines, Reference, Noble and Corona, sounded like a smaller version of the larger system in Room 2. While this sounds like a positively idiotic thing to say, in my experience you can sometimes lose important qualities when moving down a company’s line. While this system is obviously intended for a more modest room and perhaps pocketbook, the presentation was very much cut from the same sonic clothresolute, incisive, powerful yet delicate when called for. I could have listened all night. 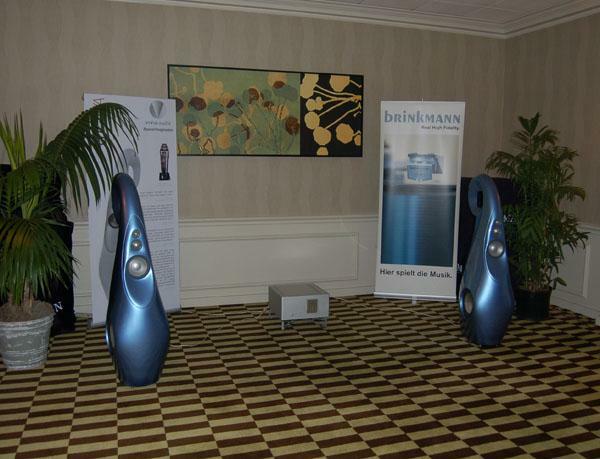 And to state the obvious, the omnidirectional radiation of the Radialstrahler 120 loudspeakers energizes the room in a different way than a conventional speaker. I found MBL’s implementation enchanting. Yes, enchanting. The bigger rig from the MBL Reference line: Radialstrahler 101E MkII loudspeakers ($70,500/pair), the world premier of the piano-white lacquer with chrome finish, 9011 monoblock amplifiers ($53,000/each), 6010D preamplifier ($26,500), 1611F D/A converter with MBLMCMi asynchronous USB input ($28,700), and 1621A CD transport ($28,000). Additional equipment included a Linux-based vortexbox computer by Simple Design, Wireworld Eclipse 6 cabling, Locus design cynosure USB cable, and SRA Scuttle rack. Fortune smiled upon me again, as I got to spend time in the MBL room with none other than Michael Fremer. If you don’t already know, Michael is very quick-witted and very funny, seemingly always on the lookout for a zing here or a gaff there. He’s also very serious about music, in a very non-serious way, and we were treated to some greatest hits from a CD he’d brought along for the show including “La Bamba” (the original), Irma Thomas singing “Time Is On My Side” (the original), and lots of other varied and equally wonderful and some wonderfully whacky music. I would also add that Michael Fremer’s informative introductions to each track added to the experience. . . I can remember visiting a NJ hi-fi dealer with my father, back before I was old enough to drive, to hear Vandersteen speakers and enjoying them then. The diminutive Vandersteen VLR ($1195/pair) sports a coax driver with a 6.5” woofer and 1” alloy dome tweeter for a claimed frequency responseare you going to question what Richard Vandersteen says? Not me, brother!of 64Hz21kHz ±3dB. 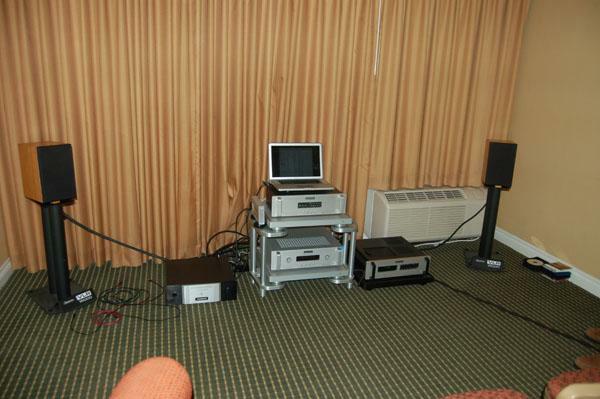 Associated equipment included the Audio Research DSI200 integrated amplifier ($6000), Audio Research DAC8 ($5000), and an Audio Research CD5 as transport. Source material was also streamed from a MacBook Pro using iTunes/Pure Music. Cable included the AudioQuest Sky interconnect, Diamond USB cable and Meteor speaker cable, and there was a Furman line conditioner in use. We listened to Greg Brown's hysterically sleepy yet gripping "Rain & Snow" from his CD Freak Flag and it held us on the edge of our seats with smiles on our faces. 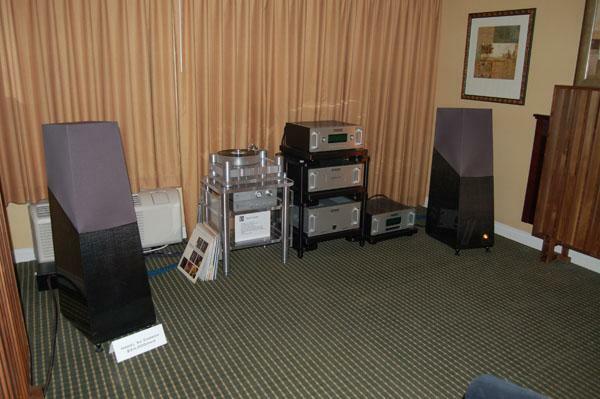 In the second room, the Vandersteen Model 5A Carbon loudspeakers ($24,000/pair) were paired with the Audio Research Reference 150 Vacuum Tube Stereo Power Amplifier ($12,995), Audio Research Anniversary Edition Reference Preamplifier ($25,000), and the Basis Audio Inspiration turntable (no price noted), which that comes with the Vector 4 tonearm with VTA Micrometer, Synchro-Wave Power Supply, Cable Isolation System, Vacuum record hold-down system, and Microthin belt. All cables from AudioQuest. 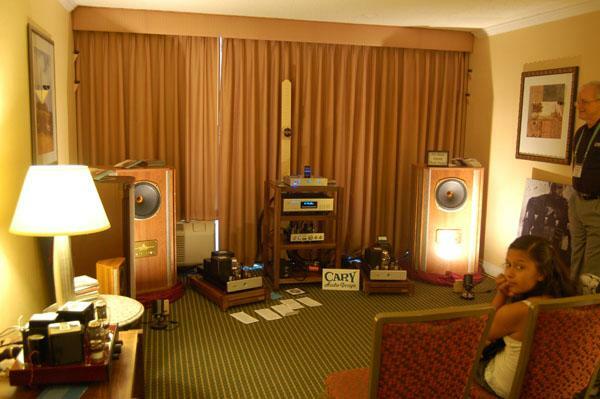 The Carbon 5A loudspeakers have a 400W subwoofer amplifier built into each speaker and Richard Vandersteen says the frequency response is 22Hz to 30kHz ±2dB, and I believe himeven in this small room, the bass was taut and fast with no bloat to be heard. The sound was relaxed and engrossing. On A Higher Note is the US distributor for Audioaero, Luxman, Brinkmann, and Vivid Loudspeakers, and Philip O'Hanlon is its founder and president. Philip is also another guy that gets it. Music that is. Actually Philip O'Hanlon has seemingly mastered the art of music presentation and is one of hi-fi's more endearing characters. You really don’t want to leave while the bow-tied and nimble-footed Mr. O'Hanlon is spinning the tunes or telling stories. To make matters better, the system we listened to was absolutely musically engaging to the extreme. It included the Vivid Audio G2Giya loudspeakers ($50,000/pair), Luxman M-800A class-A stereo amplifier ($19,000), Luxman E-1 phono stage ($4000), Brinkmann Oasis direct-drive turntable ($13,400), Brinkmann 9.6 tonearm ($4000), Brinkmann Pi cartridge ($2700), Audioaero La Source CD/SACD player also used as preamp ($44,000), with Crystal Cable in use throughout. The room was very dark, the Q5s were set up very far apart and the California Guitar Trio's version of "Bohemian Rhapsody" from their CD California Guitar Trio Rocks the West rocked my expectations, and I kept expecting (and kind of hoping) Freddie Mercury or his voice, would peer out from behind the curtain. These brands were located in the California Room, which oddly enough was in the opposite direction of everything else at T.H.E. Show. 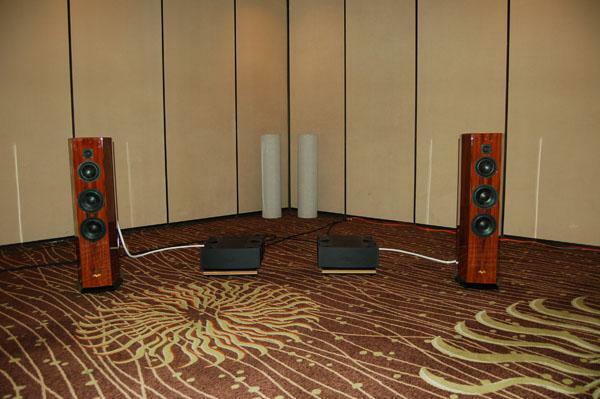 I very much enjoyed my brief time with the 90dB Reference 3A Grand Veena loudspeakers ($7995/pair), which carry on Reference 3A-s tradition of relatively easy-to-drive loudspeakers, the brand-new Concert Fidelity ZL-120V2 monoblock power amplifiers ($28,000/pair), Concert Fidelity CF-080LSX line-stage preamplifier ($20,000), Concert Fidelity DAC-040 D/A converter ($10,000), and the Concert Fidelity SPA-4C phono stage ($14,000). The turntable was the Perpetual Technology TT 1 ($2500); a Copland CCDA 825 CD player ($6500) was also in use; and all cable was from Cable Research Lab. We listened to Aimee Mann and Leonard Cohen on CD and it sounded lovely. 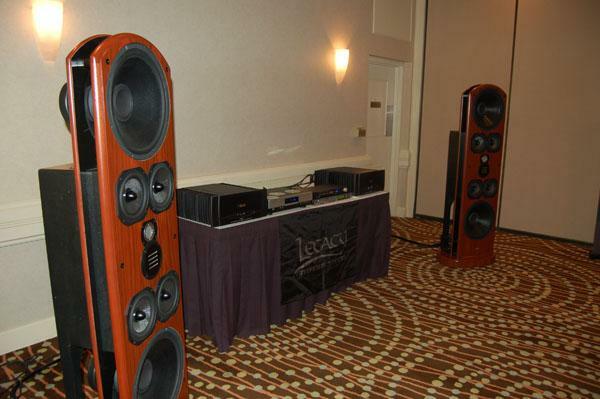 On display in the Legacy/Coda room were the Legacy Whisper HD loudspeakers ($20,000/pair), which include a pair of 500W internal amps driving the four (4) 15" carbon-fiber/pulp-composite subwoofers. I arrived at this room around 4:00pm on Sunday, the show closed at 5:00pm, and I got the feeling the very genial guys in the room were ready to relax. Since they didn’t have a hand-out with model and pricing information, one of the reps offered to write up a list which I'll share verbatim: Coda monoblock amplifiers ($10,000/each), Coda 05X preamplifier ($5500), and Coda CD player (no price given), for a total of $45,500 including the Legacy Whisper HDs. Cable was from Kimber. My notes read "very immediate vocals, balance tipped up/beaming." Clearly more time and care would be needed to hear this system at its best. 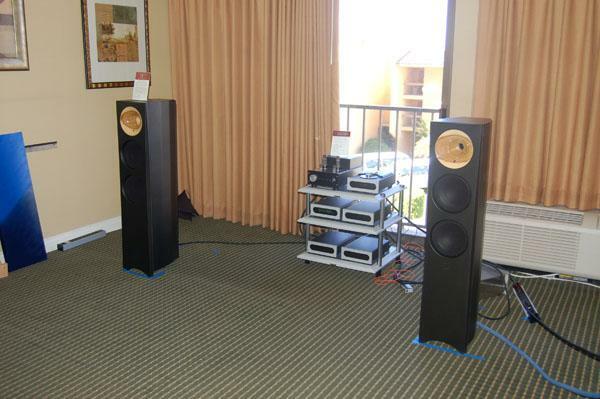 Kal Rubinson reviews the Sony SS-AR-1 loudspeaker ($27,000/pair) in the July 2011 Stereophile, due to hit newsstands next week, so I’d highly recommend reading his review if you want to know about these wonderful-sounding speakers. 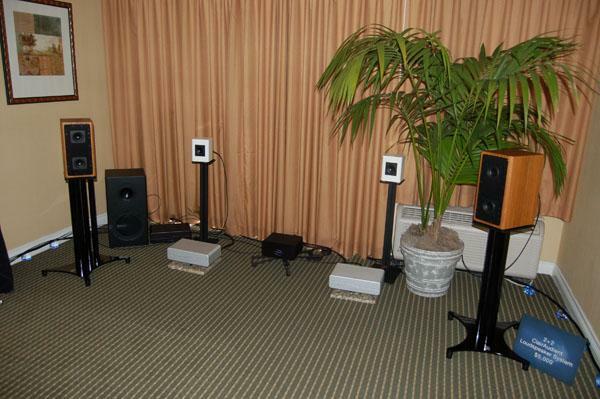 In addition to the Sony SS-AR1s, equipment in this room included Pass Labs X350.5 monoblocks, Sonoma 32 DSD multitrack recorder and editor, EMM Labs CDSD, EMM Labs DAC6SE, EMM Labs Switchman 3, with cable from Kimber Kable. System price, with two pairs of the Sony SS-AR1s, was $263,220. We listened to a gospel track and the sound was expansive and detailed, with pinpoint imagining and all in all offered a truly moving performance. 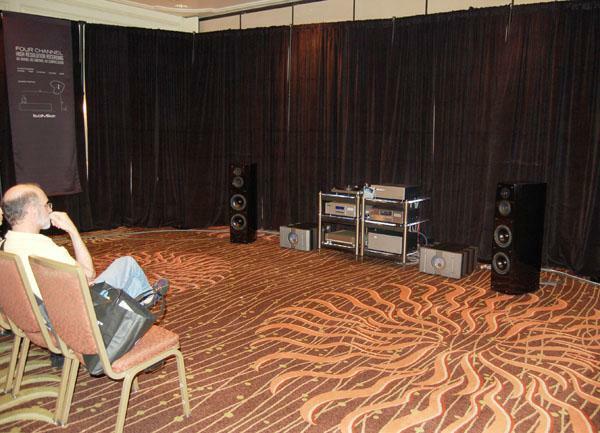 In this case, the Sonys seemed to enjoy this large ballroom, which makes me wonder what they'd be like in a normal listening room. Precision Audio Video is both a retailer and the US distributor for Venture and Weiss products. 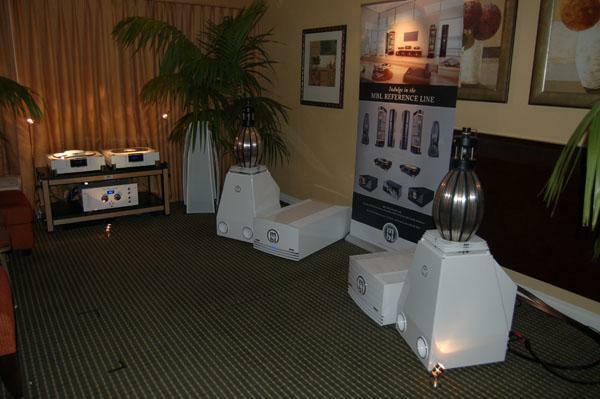 They were exhibiting the Venture Encore Loudspeakers ($46,000/pair), Venture V100A+ Reference monoblock amplifiers ($60,000/pair), Venture VP100 Reference full-function preamplifier ($28,000), Venture VP100P phono preamplifier ($26,000)"which provides substantial higher quality for the vinyl analogue play backa Spiral Groove SG1 turntable, with a Spiral Groove tonearm and London Decca cartridge. The Weiss Jason CD Transport ($24,000) fed a Weiss Medea DAC ($20,000) and all cabling was from Venture. We listened to Eric Clapton’s "Tears in Heaven" unplugged on vinyl and the very nice guy from Precision A/V kept asking his associate to turn it up. 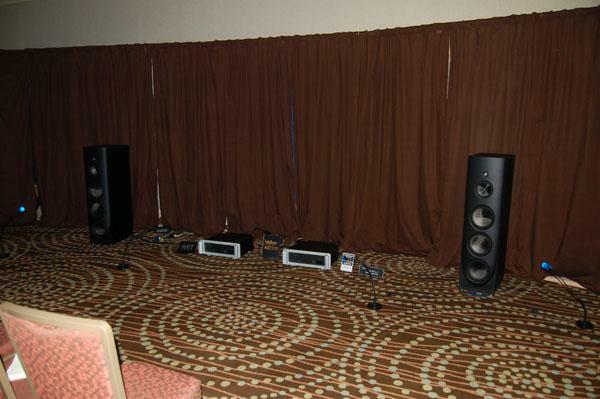 One of the issues with demoing hi-fi in a huge ballroom is that it's difficult, or damn near impossible, to energize the room and fully engage the listener. 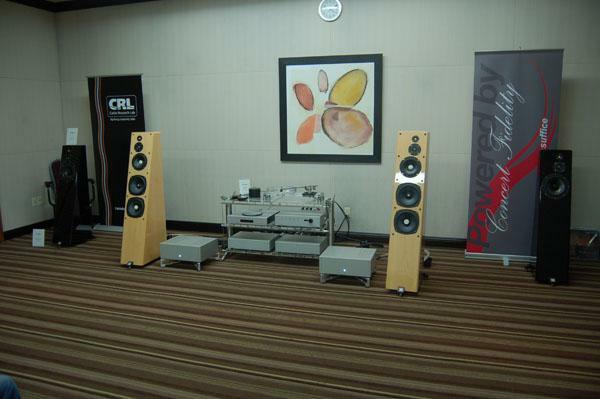 I got to hear both the Audience ClairAudient 2+2 loudspeaker ($5000/pair, reviewed in the July 2011 issue of Stereophile) and the diminutive ClairAudient THE ONE ($995/pair). Associated electronics and cables were also from Audience and included the Wavepower monoblocks ($14,000/pair), a class-D analog switching power amplifier that put out 200W into 8 ohms, the Wavemaster preamplifier ($13,000), and AU24e cables and power cords and an Adept Response High Resolution Power Conditioner ($5000). The source was an Audience-modified Oppo BDP-83SE Blu-ray player, which was not for sale (priceless). The Audience guys seemed to get no end of enjoyment watching people’s jaws hit the floor, the rug was littered with audiophile jawbones, when they played the single-driver ClairAudient THE ONE, which has nearly unbelievable bass performance for its size. Both speakers actually sounded big and solid with a nice fat midrange.